This is one in a series of more posts to come. Using a chain of Android Devices as the “Smart Part” of Roomware installations – allowing Arduino devices and XBee-based devices to become connected to an Application Pool that can extend the local setup to a global installation. Download the following applications from the Android Market on your phone. They are your starting point. Each will be discussed later. 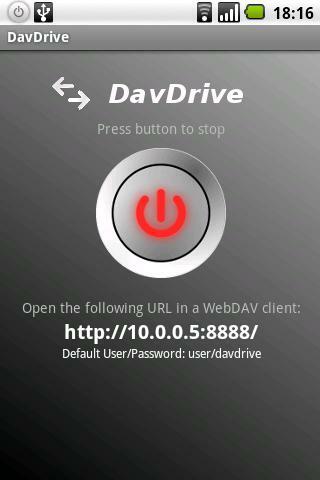 DavDrive – to make your phone available via webDAV – an alternative for the FTP solution. You might like this more than FTP. I am testing the possibilities of the Archos line of Android tablets. I want to install applications that allow me to edit Office documents and add more value to the Tablet as a possible “Netbook” computer. I also have 2 other Android devices with which I am experimenting in different setups. I can not download Android Market files on my Archos – as it does not have the Market installed. My motives are somewhat nerdish. There is no clear purpose except for wanting to do this because “all other” methods (including connecting the phone via USB to the computer and using the Android SDK) are too much fuss or rendered to be “stupid”. Fixing your IP number – Once you hook your device in the WiFi network and start communicating to it, it is nice to have a fixed IP number to refer to. 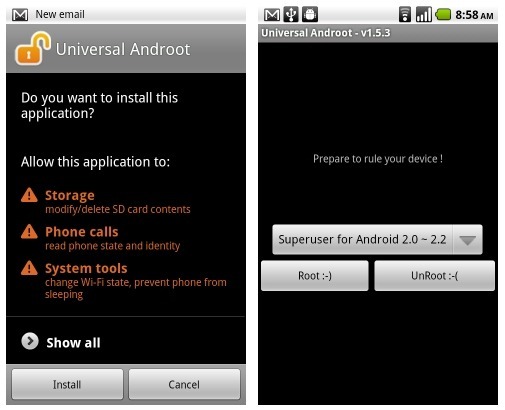 Rooting the Android device is simple for most Android phones. In my case I tested it for the Archos7 and the LG G540, using Universal Androot. The G540 roots beautifully. The Archos7 does not root at all, apparently due to a Archos-specific build of the Android OS. More info about rooting can be found on an earlier post here. Not all devices have access to the Android Market – Tablets in particular are excluded, while the applications you like to distribute and share can – in most cases – only be downloaded via the Android Market. Easy access via pre-defined connection settings – You can setup the connections to your Android Device using a fixed number. Easy access and communication between your devices – Once each of your devices has a fixed number, you can easily swap files between each other, or do more advanced stuff with Roomware or other real time systesm (more about that in a later post). Where Android offers you to force a fixed IP-number in a WiFi network, this is for all networks. As you might be a guest in someone elses network, forcing your IP number also on their system, I find it more polite to do it on a network per network basis. I found one application that does the trick: Wifi Static. WiFi Static takes your current WiFi network and allows you to configure the IP-number you want to use for your device. This configuration is per network and automatically kicks in when your device connects to the WiFi. Once you have fixed your IP-number, using an FTP-client between your devices becomes an interesting option. In my case I tested this using an Archos7 tablet and a Android phone, where the phone is rooted and the tablet is running in normal mode. Using the FTP-client and the fixed IP-address, connecting to the phone is done by selecting it from the profile. As I have Root-access to the phone, I can copy the files I downloaded, put them on a place sharable to other machines and transfer them via FTP on my Archos7 SD card. I-Jetty – “A port of the popular Jetty open-source web container to run on the Android mobile device platform.” – very hard to make work with your own stuff. I have not tested these two web servers yet, so no experiences available yet on what you can do with them and your Android device. My current preference goes to PAW Server, for the use of BeanShell, which seems to offer a very simple and straight forward way to run your Java Apps on the background. WebDAV is supported by both Windows and Mac OS. It allows you to open a direct File-browser based channel to your Android Device and with that the possibility to open multiple sessions to multiple devices and drag and drop files from one to the other. Automated start of WebDAV sharing not possible (yet) – Sharing via DAV needs to be started manually for both applications, once they are running, making automatic startup and availability of WebDAV access to your devices not possible yet. This might also be something I overlooked. ScaliCommander by Gnslngr (0.99 euro) – Offers a 2 pane list, one with the “source” items and one with the “destination” items. Does not work with Root. Others like File Expert (nice looking, FTP upload options, does not use the possibilities of Rooting), ES File Explorer (does not use the possibilities of Rooting) and the Japanese “Super Manager” does not use the possibilities of Rooting) have not been tested yet. At this point in time, I have only looked at manual file transfers. Automated transfers and synchronizations are not tested yet. I currently use either a PC or the Archos7 and Archos 32 (acting as a USB host and with mouse and keyboard connected) for the more extensive actions. Your Android FTP Servers – allowing you and others to access the FTP server and your file system. This post hopefully gave you some insight in the options you have with the Android Devices (including phones and tablets) to go beyond the basic: “watch a movie, browse a website, listen to some music” type of use. In later posts I will go into specific uses and show you how to use the Archos7 tablet as a “Netbook”, by connecting a keyboard and mouse via a USB hub and running a simple Office Suite allowing you to create, open and edit Word and Excel files on your Android device. I will also release a new Android Roomware Client / Server in due time allowing you to share sensor data (including those from your phone) between devices within your WiFi network. Peter Kaptein is an ICT professional, building things in Flash, .NET and involved in the Roomware Project. Next to this blog he also writes about Flash in his flashWorks blog. How do you connect to Interactive Spaces?